Teams of worship leaders from churches and Christian schools in eight states are visiting Samford University this week studying ways to equip young artists for leadership in worship services. The program also is encouraging adults in the churches and schools to support the regular use of young people in worship services. 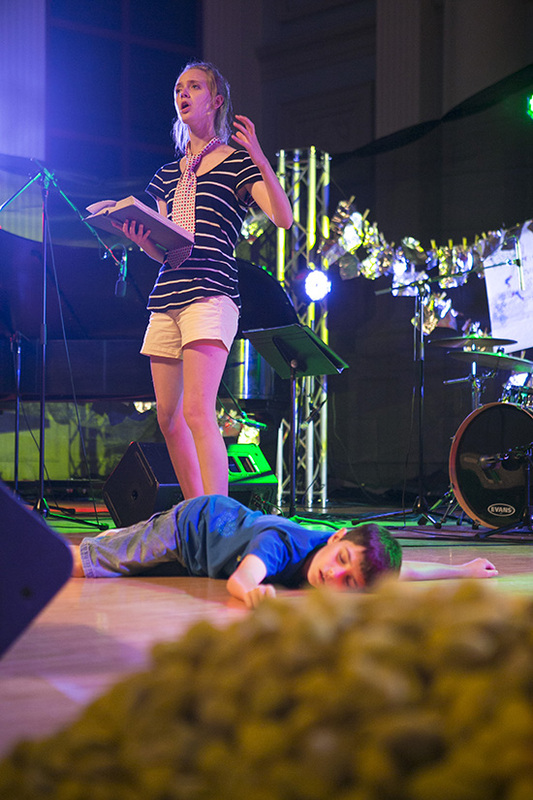 Known as Animate, the ecumenical intergenerational workshop is providing adults an opportunity to learn about a new wave of youth ministry, and is giving students a chance to hone their artistic skills for worship leadership. Animate is sponsored by the Samford School of the Arts as an initiative of its Center for Worship and the Arts. The program was one of several funded by a $300,000 grant from the Christ Is Our Salvation (CIOS) Foundation of Waco, Texas, in 2013. A total of 154 people from 14 churches and schools are enrolled in Animate, including 93 students and 61 adult leaders. "The intergenerational aspect makes this program unique," said workshop leader Eric Mathis, assistant professor of music and worship at Samford. "Our youngest participant is 11 years old, and the oldest is 71." The four-day workshop provides time for students to choose from six interest tracks that offer different approaches to leading worship: film, drama, music technology, choral music, visual arts and narrative. Students choose two specialties initially, then concentrate on one. At the same time, adults are attending their own workshops that focus on youth ministry, relationships and nurturing environments. The teams then come together on the final day of the workshop to lead the workshop service. "This is a test camp," said Mathis, "and the reception has been overwhelmingly positive. It gives the young people a chance to pull from several worship traditions. In our opening service, we had everything from a brass quintet to a praise band to a poet to a visual arts presentation. "And we had a period of silence, which is a departure from the high energy services that many associate with youth worship leaders." Mathis said the goal of the workshop is for the young people to come away with greater focus and skills in worship leadership, and for the adults to be able to take a lead in advocating greater use of young people in worship services. "Young people are open to a variety of styles and ways to worship God, as long as it is done well and with purpose," said Mathis. As part of the workshop, Mathis said he would visit the participating churches and schools in the fall to assess the program's benefits after the various teams have implemented their worship plans. He will use that information in planning another Animate program for next summer.